October 9 marks the feast date of the early Christian martyr Saint Denis. (cc) image from minifig of the saint’s statue at Notre Dame. 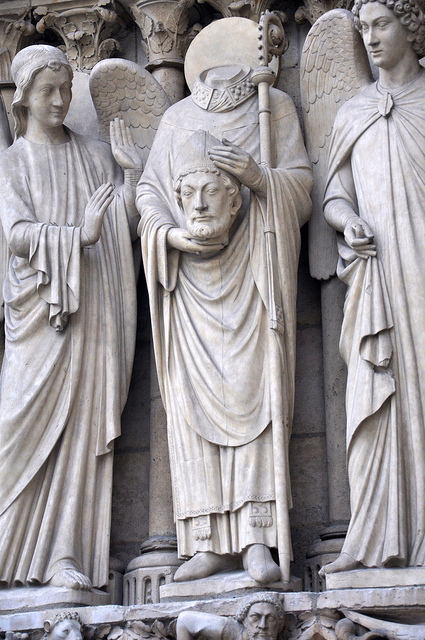 When this missionary bishop to Paris got the Roman chop* for his conversions sometime after 250, he scooped up his own severed noggin and carried it to his preferred burial spot. Upon that eventual pilgrimage site would spring up a medieval basilica whose 12th century renovation turned it into a pioneer of Gothic architecture. While many Christian martyrs carry the instruments of their martyrdom in iconography, and a few others roll with the bits of severed flesh exacted by those martyrdoms, Denis is only the most notable of an entire designated sub-class who carry their own heads: cephalophores. This subject, seemingly tailor-made for a They Might Be Giants song, finally got one in 2011: “You Probably Get That A Lot”. A most profane footnote was appended to our holy man’s legend during the French Revolution. Saint-Just is supposed to have retorted upon hearing the slight, “I’ll make him carry his like Saint Denis.” He did it, too. * Two companions, Rusticus and Eleutherius, were doing the same conversions and suffered the same execution. Nobody named cathedrals after them.